WR Jermaine Kearse vs. CB Chris Harris Jr. – Two of the best slot players in the game will face off in this one. This season, Kearse averages 2.34 yards per route run in the slot, which is the best out of 59 qualified receivers. And on the other side, Harris remains a dominant force covering out of the slot. He allows only 0.79 yards per coverage snap out of the slot, which ranks tied for 10th-best out of 50 qualified cornerbacks. He is also second in coverage snaps per reception allowed at 18.3. T Kelvin Beachum vs. Edge Shane Ray – Beachum has probably been the Jets’ best pass blocker this season, as his pass-blocking grade of 77.7 ranks 24th out of 80 qualified offensive tackles. He will see a lot of Shane Ray, who has really struggled in 2017. His overall grade of 46.9 ranks 108th out of 115 qualified edge defenders, and he has only forced 13 total pressures, which is tied for 38th out of 47 qualified 3-4 outside linebackers. With Von Miller surely drawing extra attention, Beachum will be called upon to win this matchup one-on-one often. 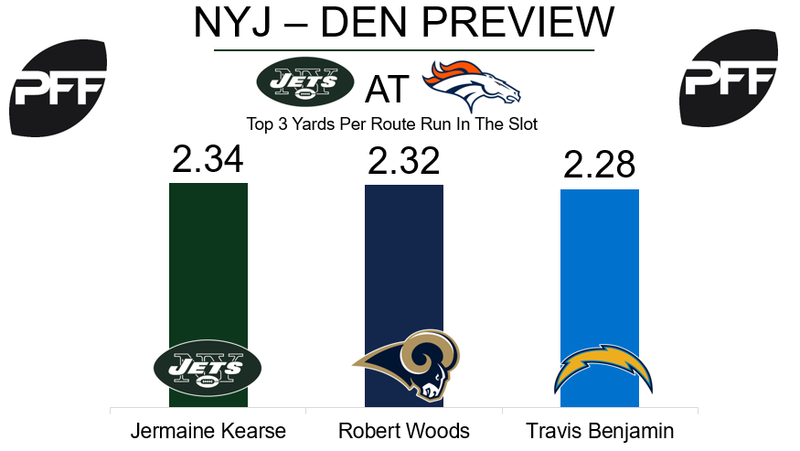 WR Chad Hansen vs. CB Bradley Roby – This could be an underrated matchup to watch, as a lot of attention will be focused on Robby Anderson and Jermaine Kearse. Hansen has logged 198 snaps this season, and his overall grade of 50.8 would rank him 84th if he had played enough snaps to qualify. Bradley Roby, on the other hand, has been terrific. He is the 16th-highest graded cornerback at 85.6, and was phenomenal last week in Aqib Talib’s absence, as he was targeted eight times and only allowed two receptions and a passer rating of 49.0. RB Devontae Booker vs. LB Demario Davis – With Booker reportedly battling the flu last week, he played his fewest snaps since Week 7. 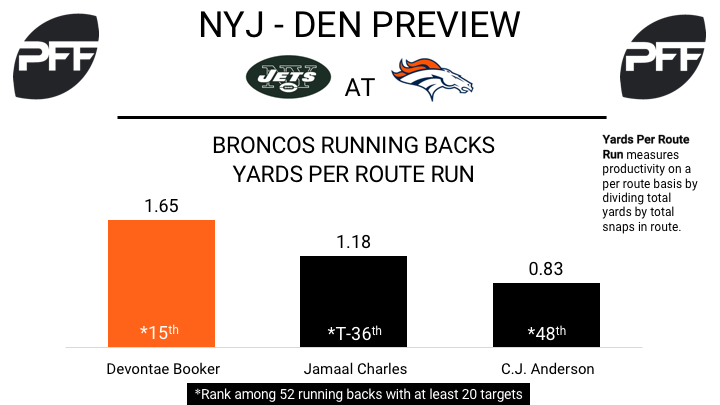 Booker is the Broncos’ best receiving back, and with the Broncos offense struggling to find consistent quarterback play, they may find themselves having to throw a lot due to another lopsided score. Booker averages 1.65 yards per route run, 15th-best among 52 running backs with at least 20 targets. Davis has been decent in coverage this year, as his coverage grade of 72.8 ranks 30th of 79 linebackers. He’ll look to limit Booker’s production, assuming Booker is healthy enough for more playing time this game. WR Demaryius Thomas vs. CB Buster Skrine – The Broncos should look to take advantage of Thomas’ matchup when he lines up against Skrine this week. Skrine’s coverage grade of 47.5 ranks 90th of 117 cornerbacks, while Thomas’ receiving grade of 72.3 ranks 61st of 116 wide receivers. Thomas is coming off his lowest-graded game of the season and has now failed to find the end zone each of his last two games after scoring in three straight prior. He’ll look to get back on track this week against Skrine, who has allowed five touchdowns this year, tied for fourth-most among all cornerbacks. C Matt Paradis vs. DI Steve McLendon – Paradis has a tough matchup against McLendon in the run game this week. Paradis has graded pretty well in run blocking this year, earning a grade of 73.5, 10th-best among centers. McLendon has been a force up front, leading all interior defenders in run stop percentage, recording a run stop on 20 of his 152 run-defense snaps (13.2 percent). Last week, however, McLendon failed to record a run stop for the first time all season, though he only played on one run defense snap.